Sixty years before his 111th birthday party Bilbo (Martin Freeman) is enjoying a pipe outside of his hobbit hole when Gandalf interrupts him to inquire if he wants to go on an adventure. Bilbo says no and tells the old wizard “good day”. Little does the young hobbit know that Gandalf (Ian McKellen) doesn’t take no for an answer and he sends thirteen dwarves to Bag End for a meeting and to cause a bit of mischief. The leader of the dwarf clan is Thorin Oakenshield (Richard Armitage) who has a map that will lead him and his crew back to Erebor, which is now known as the Lonely Mountain. Something gets sparked in Bilbo to make him realize that he really wants to go on an adventure and he goes off to join the rest of the gang into journeys unknown. Going back to Middle Earth was a welcomed holiday gift. 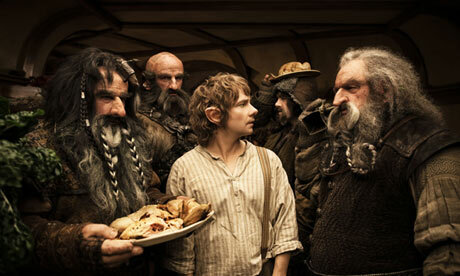 "The Hobbit: An Unexpected Journey" stands tall with "The Lord of the Rings" trilogy and on its own as great film. Peter Jackson has brought all the spectacle and wonder that filled the previous hobbit-filled films while telling a much different story. The story of Bilbo is far different from the one Frodo goes on; Bilbo’s is full of excitement and adventure while Frodo’s is a mission to save the world. This change in tone is a welcomed one because it lets the film have funnier characters and more set pieces that are outrageous. What makes these scenes with heavy dialogue still watchable is that the acting in this movie superb. There were the returning players who brought back everything that we loved about those characters. Ian McKellen seems to really revel in playing Gandalf the Gray whether it’s having a few laughs with the dwarves or having a heavy talking scene with another member of the star-studded cast. Martin Freeman’s portrayal of Bilbo Baggins is both equal parts hilarious and sympathetic. You feel for him when he is being mocked or insulted by the dwarves but then in a few moments you’re laughing at just the slightest facial expression from Bilbo. If you’re a fan of Lord of the Rings and can open your mind up to a little more outrageous adventure though Middle Earth you’ll really enjoy this film. And if you’re not a fan of the series, sit back enjoy the wide, beautiful landscapes of New Zealand. Visit T-Shirts.com, where you can find the perfect LOTR or Hobbit t-shirt for any fan.